Hara-kiri is the Japanese expression for honour suicide. That is, killing yourself because you failed in your mission. The idea that will be explored in this article is that the Government will probably lose the next election because of its current strategies. As an intelligent group of people, the UNP has to be aware of this probable outcome. If it continues with the current economic game plan, because it believes it is good for the country, and is prepared to lose an election, for the sake of doing what is good, it becomes an act of political hara-kiri. Thinking big is good. Free trade, financial hubs, major foreign investments, big industrial projects. All good stuff. Will they provide great economic benefits, good GDP growth, increase in foreign reserves, reduction in debt, increase in employment, etc.? No models of such benefits from these strategies on a time scale have been provided by the Government. It is of course difficult to construct such models when you pursue big ideas. The results are long term. There is an element of an act of hope with no certainty that the hope will be realised. The benefits, if they materialise, will be seen as skewing towards the big private sector. The major owners of the public quoted companies and the owners of the large unquoted private companies like MAS, Brandix, Munchee, Maliban, Hirdaramani, etc. If you include the new entrepreneurs who have acquired wealth more recently through deals, commissions, tenders or even bribery, maybe 100,000 big business families will benefit. The new business generated will also benefit others. There will be new jobs and the service industries will benefit. The spending of new money will impact the sales of luxury goods, cars, apartments, etc. Most of this will be in urban areas, largely in the Western Province. This urban population that benefits will support the Government. They are a part of the oasis of prosperity which is surrounded by the vast desert of people who are considerably less well-off economically. But the problem is, that even at 100,000 families and the secondary beneficiaries, they are still only a small a part of the total population. The statistics published claim a rural population of between 75% and 80%. 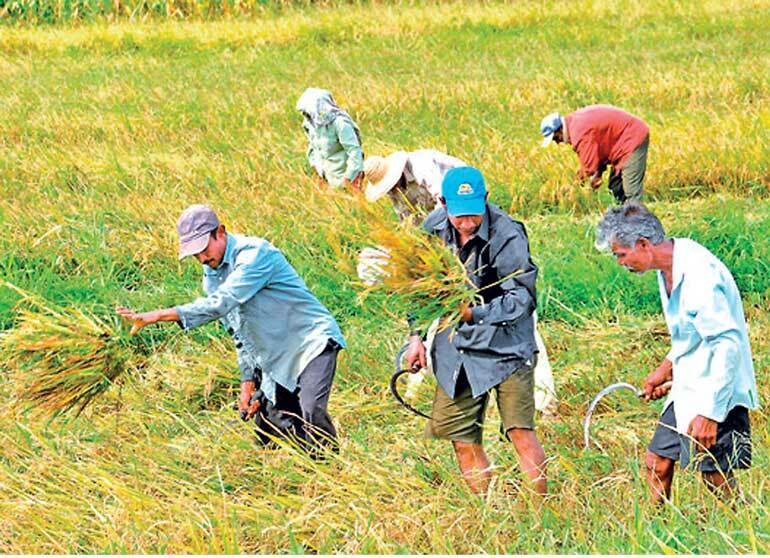 Excluding those working for the Government in the rural areas, the rest are all private sector. They are the people’s private sector. This includes all those in agriculture, smallholders in tea, rubber, coconut, the paddy farmers, others in various types of agriculture, fruit, vegetables, spices, the fisherman and those connected with the fishing industry, the entire retail network of grocery outlets, small “hotels” selling food, hardware stores, the whole raft of small industry, bricks, tiles, wood and metal industries, etc., the artisans, bricklayers, carpenters, plumbers, electricians and a host of service industries. 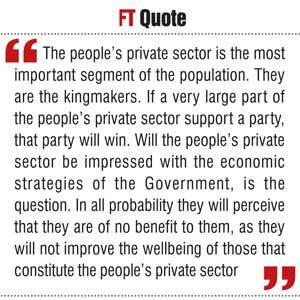 The people’s private sector is the most important segment of the population. They are the kingmakers. If a very large part of the people’s private sector support a party, that party will win. Will the people’s private sector be impressed with the economic strategies of the Government, is the question. Will they perceive another highway as something that is good for them? Will they perceive creating a port city as something that is good for them? Will they perceive that an inflow of foreign funds to set up an industry as good for them? Will they perceive that the Megapolis is good for them? Will they perceive that Free Trade Agreements are good for them? In all probability they will perceive that they are of no benefit to them, as they will not improve the wellbeing of those that constitute the people’s private sector. The people’s private sector will smile if the Government says it has cancelled plans to build new highways and to create a Megapolis, etc. and the funds will be used to support the development of the rural areas. Like for instance, to build cold storage facilities at fishing ports and vegetable wholesale markets and lorries with cool rooms to transport produce to the towns, subsidised fertiliser, better storage for paddy, aerial spraying of paddy lands to control disease, better roads, rural hospitals, and micro finance facilities extensively. They will perceive that all of this is hugely beneficial to them. People will vote for the party they perceive as good for them. Perception is reality. If one were to say that their perception was wrong, it would make no difference. What they perceive is reality to them. Perceptions are created by the vibes of what they see, hear, feel, etc. If you throw bread off and on to the crows, they will be grateful at the time but are not likely to believe that you are really interested in the welfare of the crows. If you do it every day, they will believe that you are interested in their welfare. The current strategies of the Government are not likely to be perceived as beneficial or supportive of the rural/people’s private sector. To gain the political support of the rural/people’s private sector, the Government has to create the perception that it is seriously committed to inclusive growth. The starting point has to be the Government in its own mind being seriously committed to it. Sincerity can be seen, it can be felt, and you can almost smell it! If it does not create this perception of an abiding commitment to the development of the rural areas/people’s private sector, the Government will lose at the polls. One key take out from what Marx said is straightforward. Both capital and labour are required for any economic activity. They both have to be paid. The wages paid to capital was totally disproportionate to the wages paid to labour. Therefore labour should revolt and overthrow the system so that the means of production can be owned by the people (the state).Then there will be an equitable payment to both capital and labour. The Marxists in Sri Lanka, who also believed in revolution, ruined the country after they crept under the sari pota into Mrs. B’s Government. They are truly dead and buried. So we will not see a Marxist-led revolution in support of the people’s private sector. However, we have is a scenario that is similar. Marx was about the allocation of profits. It is now a question of the allocation of resources. The perception is that the resources allocated to the benefit of big business and urban areas is totally disproportionate to the resources allocated to the rural/people’s private sector. A revolution will take place in protest to change this current allocation, but the revolution will be at the ballot box. The question is whether the Government will refuse to change the allocation of resources and instead be prepared to commit political hara-kiri.